One issue I’ve noticed in a lot of paranormal fiction is scale: getting too big too fast. All the vampires have a werewolf bodyguard, legions of angels are waiting behind every storm cloud, and the sewers are bursting with more vampires than rats. I offer a different viewpoint: less is more. Read the rest over at Vamped.org! 5.0 out of 5 stars: A Highly Original, Enticing Read! An unsolved murder…and a surprising revelation that solves the mystery, I liked that. The heroine was strong, I cared about her. That is so important in a novel. I particularly cared as I witnessed her adjusting to her new existence. The villain was very well done, without being overdone. I found him deliciously savage! And I liked, too that everything was wrapped up nicely with no loose ends. I really enjoyed the author’s take on vampires. He’s given them very interesting characteristics. The heroine for instance discovers that she will never dream again and I found this very poignant. I like vampire fiction that depicts vampires as complex characters–where their living lives and their undead existence is developed nicely. It makes for an interesting story. There are also ghosts and hauntings and surprises too. What more could you ask for? Between the passengers and their equipment, six people occupied the space of twelve, almost the capacity of the elevator. Five of the riders wore blue gloves and knee-length white coats over scrubs; the sixth wore a dark suit and a wireless earpiece. A lab cart had been assigned to each of the technicians while the man in the suit carried a computer tablet. Everyone looked straight ahead in silence, focused on the task at hand. The doors opened; the stop switch was pulled. The suited man started a timer on his tablet as the five techs pushed their carts out of the elevator. Of the twenty doors in the long hallway, five had been pre-selected; in concert, the techs knocked and waited while the suited man watched. One by one, the techs disappeared into the rooms as each door opened. The suited man quietly observed from the hallway so as not to interrupt the collection; time was of the essence. In the first room, the elderly resident had been watching a movie before pausing it. He surrendered his right arm as the tech prepped his skin and expertly inserted a needle attached to a cup. The resident winced for a moment and relaxed. Collection was already proceeding in another room. The tech quickly inserted a red-capped glass vial into the needled cup and twisted it to begin the flow of blood. When it was filled, she twisted it out again and replaced it with another. The move was practiced and smooth; the donor smiled at the absence of any discomfort. Once the needle was removed, a sterile gauze pad was taped over the skin as familiar instructions were hastily issued to the donor. The suited man checked the time as the technicians emerged from their assigned rooms. On each of their carts were ten red-capped glass vials filled with blood, fifty in all. Noting the collection on his tablet, the group headed back to the elevator. Once everyone was inside, the stop switch was depressed to release the elevator; the doors closed. On the ground floor, the collection carts were pushed into the secured blood lab while the suited man followed. Each of the procured vials were quickly but carefully inserted into a circular tray that held the exact number of samples collected. The tray was pushed beneath a stainless steel apparatus that aligned with each vial simultaneously; a lever raised the tray into the metallic device and locked it into position. Levers on two support arms elevating the apparatus over the table were disengaged, allowing the entire device to be inverted. Alerted by the beeping from a standard microwave oven, a warmed ceramic cup was withdrawn, black on the outside and white on the interior, the tall kind used in trendy coffee houses. After securing the cup beneath a nozzle, a button was pressed that drained the vials into the waiting cup below, filling it to within half an inch of the top – a perfect pint. The suited man noted the time on his tablet, nodded in approval to everyone in the lab, and took the cup away with him. In the office he worked out of, he set the cup down on the far edge of his desk and checked to ensure there was no spillage. Satisfied, he sat down and resumed his work, waiting. Within a few minutes, the executive administrator entered the office. Going right to the cup, she smiled at its warmth as she picked it up. After flashing him a knowing smile, the administrator lifted the cup to her lips and drank deeply. How about a book trailer? As you wish. New Book Review of The Matriarch by The Vampire Source! 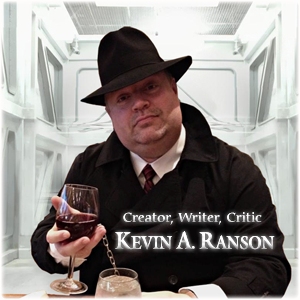 … (Kevin) Ranson has effortlessly merged a mystery thriller with the allure of a vampire horror story. At every twist and turn, new revelations came to light and added even greater depth to the storyline. I highly recommend this book to anyone who fancies a cleverly written thriller/horror that banks on the idea that well-developed characters with a sense of humor are the key to a great piece of fiction. I’ve been featuring a number of favorite tunes that puts me into the world I’ve created and that have helped to mentally shape that world; if it was a movie, what would the soundtrack be? Most of these I’ve featured – I’ve included the song, a corresponding scene, location or character in parenthesis, and the artist. The last song, “My Songs Know What You Did” by Fall Out Boy, immediately sounded like the combination of everything, the perfect roll-the-credits song – if The Matriarch were ever made into a movie. Life Is Beautiful – Acoustic (The Funeral) – Sixx:A.M.
WTF Books has published The Matriarch! Get it now on Amazon Kindle and compatible apps. More options coming soon. Enjoy! Every October, the freshmen at Glenville State College are told stories about Sis Linn, the local ghost who haunts Clark Hall and the graveyard where she’s buried. Murdered in 1919, she was beaten beyond recognition, the target of a brutal killer who was never caught. When present-day student Janiss Connelly stumbles upon the truth, she inherits a unique opportunity to end a century of bloodshed… even if it’s already too late for her.